Roshini is my family relative, and I am fundraising for her medical treatment. Roshini, 14 years old young girl,affected by Cancer ( Lymphoblastic Lymphoma ) and undergoing treatment at Cancer institute (WIA) Hospital, Adyar-Chennai. Total duration of treatment is 2 and a half years. 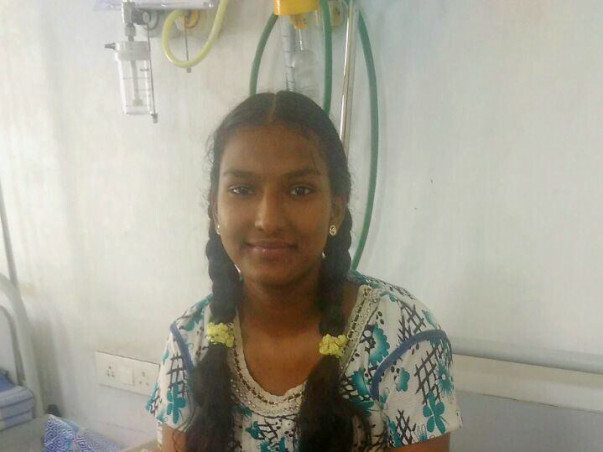 The approximate expenditure of the whole treatment will be 10,00,000 Rs/- ( 10 Lakhs INR ).Please help Roshini through your small contribution. Here is a quick update on Roshini's health. Her health is slowly improving. The treatment is going on. She has been administered two cycles of chemotherapy as of now and her response to the treatment has been good. She has normal side effects like body pain, nausea, stomach pain etc. The doctors have assured that this is normal and she will recover from them. The doctors had initially prescribed 6 cycles of chemotherapy out of which two have already been administered. After two more cycles, there are a few tests that have been scheduled which will help in deciding the future course of action. Thank you for all the support you have shown Roshini. Please do pray for her health. 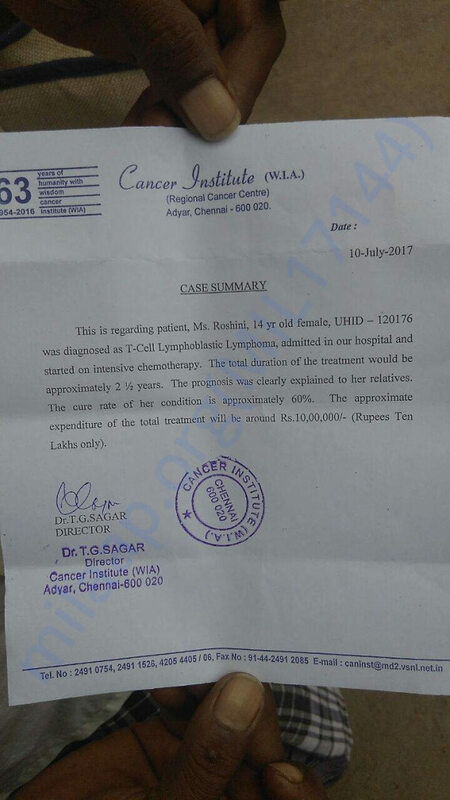 Roshini got admitted into Adyar cancer institute (Chennai). She was in general ward until yesterday. Currently, they are treating her in ICU as she started vomiting more. I will keep you all updated as we progress on the treatment. We request all of you share this campaign with your family and friends. Thank you for all the love and support. God is there with you! Get well soon!